In addition to a very robust free tool that has a lot of great features, we also offer an Education plan for universities and non-fee-paying schools. Eligible institutions receive a 30% discount off our regular paid plan. For example, for 1 calendar, the price would be $7 per month. And if you would like to pay for 12 or 24 months in advance, that would give you additional discounts. If you create an account with an email address ending in .edu, .ac.uk or .edu.au this status will automatically be added to your account. If you created your account with a personal email and then changed the account email to your .edu email - the discount will not be automatically applied. Please get in touch with us before upgrading. If you don't have an email address with this ending, please first get in touch with the Customer Success team with your YouCanBook.me account email address and details about your school and we can add the Education status to your account before you upgrade. 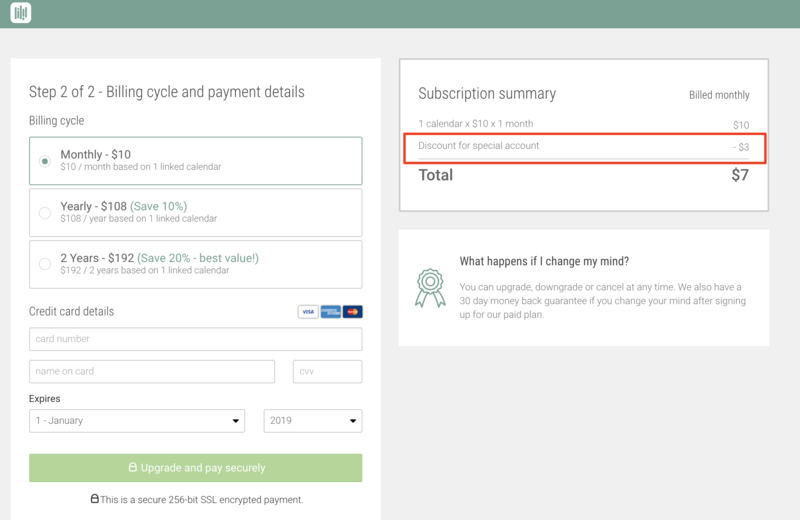 You will see the discount appear on the last page of the billing process - on the payments page.